What Kind of Cat Has Really Short Ears? "I'm the only kitty with folded ears." Modern purebred cats display unique features that make them special. Certain breeds put a smile on your face with their adorable small ears, which make some look like a bit like sheepdogs and others like lynxes. An official breed since 1981, the American Curl features small ears in a new shape that resulted from a mutation. Instead of pointing forward, as a normal cat’s ears do when they are relaxed, the tips of the Curl’s ears point backward in a gentle arc. The small, rounded ears also feature tufts like that of a lynx. 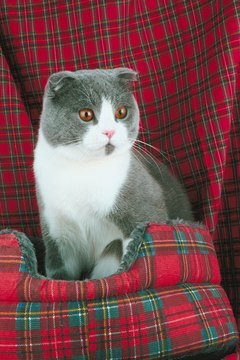 Highlanders sport a spotted coat and curled ears that resemble a wildcat’s. But this small version is domesticated and sweet. A Highlander’s small ears don’t come to a point like a typical domestic cat. This super-social cat loves a home with people around to give him lots of love and attention. A Persian’s large size and tons of long fur make their small ears look even smaller. Persians have large eyes and a small nose, so their faces look a little smushed. This laid-back breed comes in so many different colors that it is divided into seven different categories in cat shows. Scottish Fold cats have the most distinctive ears of any breed. Their ears actually fold over, hence the name. The fold makes their ears appear even smaller than they actually are. The small ears mean that their big eyes get all the attention. Both long- and short-haired Folds appear in many color variations. Why Do Kittens Like to Be Petted?